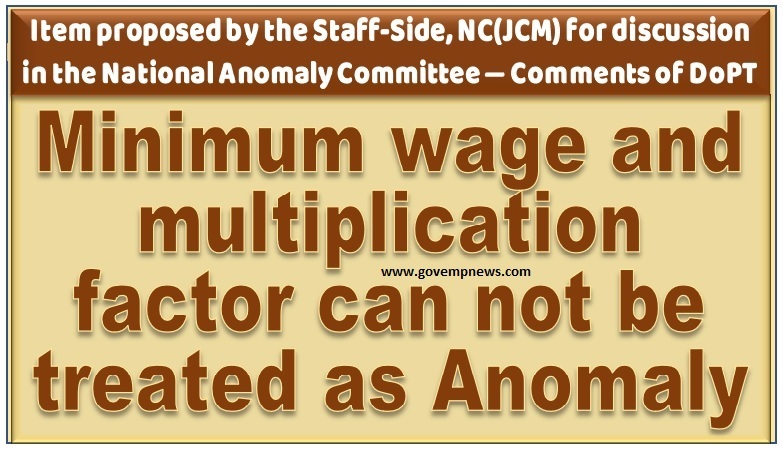 DoPT comment: As against the Minimum Wage decided to be Rs. 18000/- by the Govt. w.e.f. 01.01.2016, the Staff-Side has said that this should be not less than Rs. 26,000/- and the multiplication factor ought to have been 3.714 and not 2.57. They have further asked for the pay matrix to be changed. Objecting to the methodology adopted by the 7th CPC in computing the Minimum Wage, they have given a number of reasons like the retail prices of the commodities quoted by the Labour Bureau being irrational, adoption of the 12 monthly average of the retail price being contrary to the Dr. Aykroyed formula, the website of the Agriculture Ministry giving the retail prices of commodities forming the basis of computation of minimum wage provides a different picture, so on and so forth. However, when one compares this item with the three situations given in DoPT's OM. No. 11/2/2016-JCA dated loth August, 2016 and 20th February, 2017, it does not appear that this satisfies any of them to be treated as an anomaly.